Fig. 1. 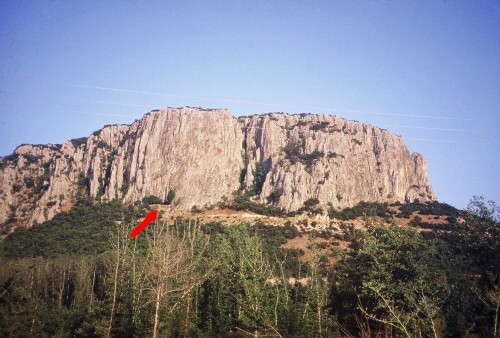 The Theopetra rock. 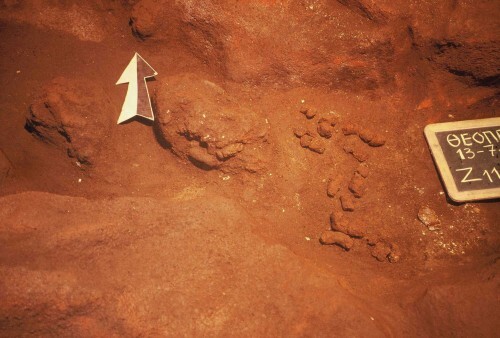 The position of the entrance to the cave is marked with an arrow. In the present article we will briefly mention the findings, whether in situ or moveable, that have repeatedly been presented at various conferences and in publications (see Kyparissi-Apostolika 2000, 2000a with articles by collaborators). 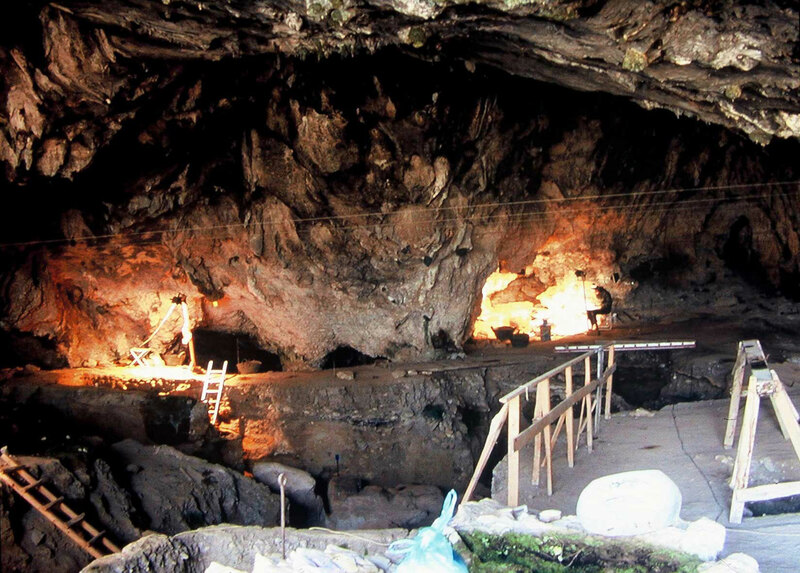 The Theopetra Cave is to the right of the route from Trikala to Kalambaka, 3klms behind the latter (fig. 2), at an altitude of almost 330m above sea level and 100m above the valley, on the north side of a limestone mass that rises above the Local Department by the same name of the Municipality of Kalambaka (fig. 1). The Lethaios River, a tributary of the river Pineios, lies close by, and part of it flows through the town of Trikala. The cave’s shape is almost quadrilateral with small niches (karst conduits) on its periphery (figs. 3-4). It has an area of almost 500 square metres. The entrance is arched, with an opening of 17m and a height of 3m, allowing abundant natural light to enter its interior (fig. 5). Directly opposite one can see the cliffs and monasteries of Meteora. It is Thessaly’s most western prehistoric site and being in direct proximity with both the plain of Thessaly and the Pindos mountain range of Koziakas, has embankments that combine features of these two natural environments. Years of excavations revealed the largest known sequence of prehistoric embankments (approximately 6m thick) (fig. 6) representing part of the Upper Pleistocene period -constituting their bulk- connecting the Pleistocene with the Holocene period and the Mesolithic seen for the first time in Thessaly as well as the Neolithic which, till now, had only been familiar to us from open air sites in this region. The embankments in the Theopetra cave can be divided into two completely different periods of the cave’s use: that of the Pleistocene (Middle and Upper Palaeolithic period) and that of the Holocene (Mesolithic and Neolithic) (fig. 6). 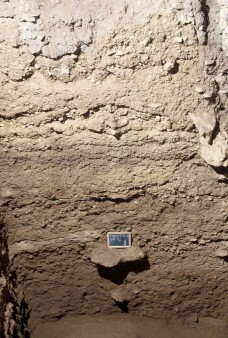 In quantitative and morphological terms both stratigraphies are completely different: the maximum thickness of the first is 4.50 metres in the cave’s central area where are the thickest embankments, whereas in the east and south periphery, where the excavation reached the natural limestone bottom, the respective embankments are no thicker than 2.50-3.00 metres. Consequently, the surface of the limestone substratum on the bottom of the cave is not flat but uneven, being deeper in the centre and considerably higher on the periphery. 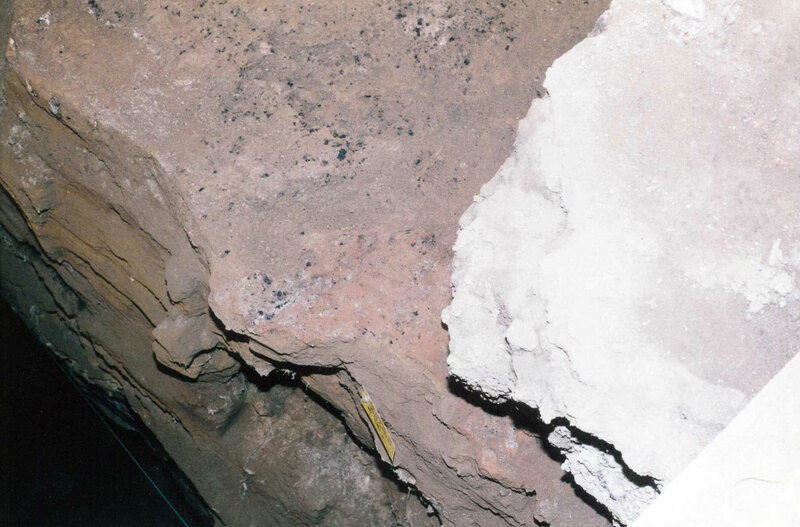 This is the reason why the deeper central area of the cave repeatedly filled with sediment due to deposits of water, as already referred to, and partly from the cave’s wide entrance. The latter is also confirmed by the downhill course of the hardest of the sediments moving from the entrance towards the centre (figs. 9-10). 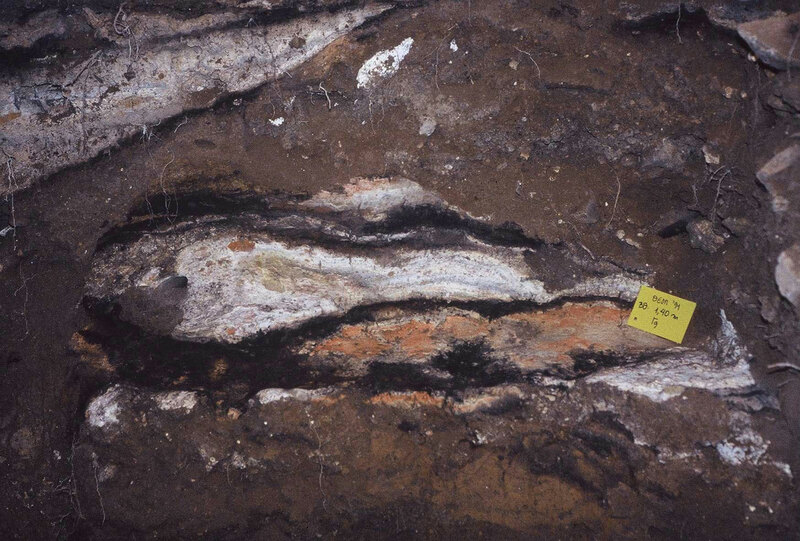 This sediment represents the last Ice Age of the Pleistocene period. The second period represented by the Holocene is not thicker than 1.50-2.00 metres and only where the successive layers coexist. 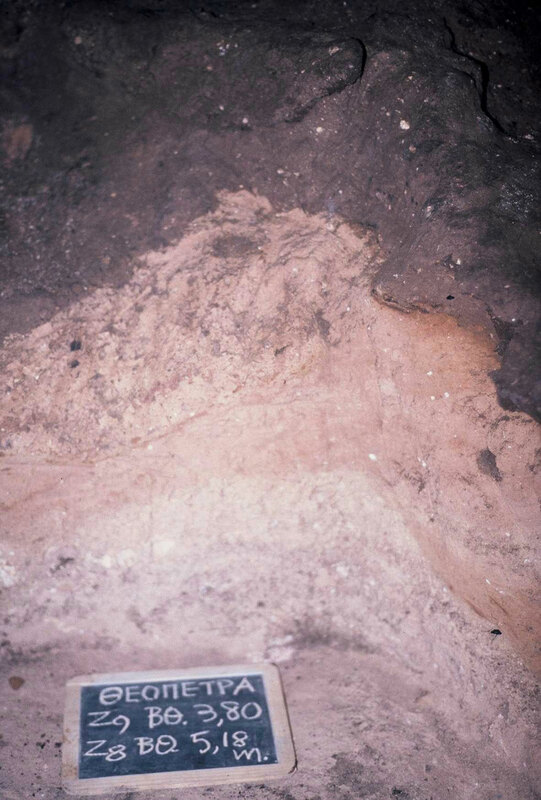 a) The lower layers of the Pleistocene embankment consist of a pink coloured moist sediment (figs. 10-11) 50-70cm thick, in which residues of fire are entirely lacking, although the presence of pellets in it suggest the presence of humans without the use of fire (Tsartsidou 2013, Tsartsidou et al. forthcoming). The date of the depositing of this sediment should be prior to 130-140,000 years according to newer forms of dating. One such is the method of thermoluminescence (Valladas et al. 2007) used on burnt stone tools coming from deeper layers with residues of fire (which, obviously, lie above the deeper ones without fire, figs. 10-11) in the C.N.R.S Research Centre in France (Centre des Faibles Radioactivités, Laboratoire Mixtes C.N.R.S.-C.E.A.). 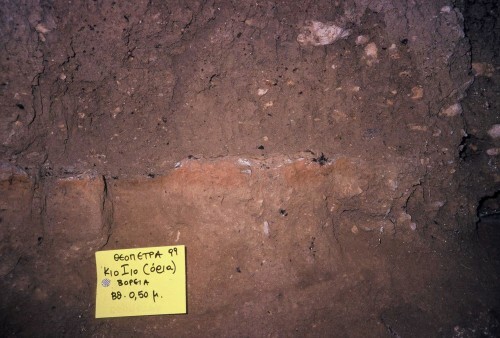 The same strata had initially been dated by Carbon-14 in the National Center for Scientific Research “Demokritos” as being about 46.591+1665 years before the present day (Fakorellis and Maniatis 2000). This was the earliest date to be determined using the Carbon-14 method as the latter cannot accurately work out dates exceeding this limit. 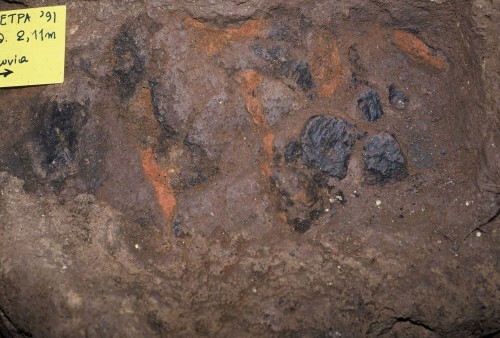 From this deeper sediment, so far only partially excavated, came tools made of flint (figs. 11-12) found trapped inside limestone gravel from the bottom of the cave, as well as quartz that was used more during the Middle Palaeolithic period, rather than later. The very few, therefore, occupants of the cave, when first in use, must have used raw material for their tools found at the bottom of the actual cave, whereas later, when the population and its needs increased but the material was gradually being exhausted, the search for it became much more organized at a great distance outside the cave. This sediment’s tools, which are the oldest of all found in the excavation, are generously crafted compared with the later ones. 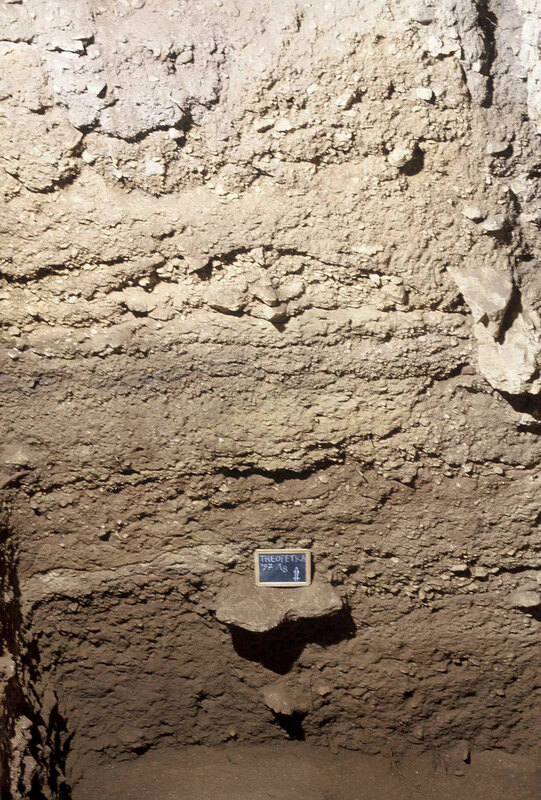 b) The second section with a maximum thickness of 2.50 metres, features thick layers of extensive fires alternating with sandy and silted layers of matter deposited from the flow of subterranean waters into the cave. At times, these waters created a pool in the largest, deepest and most central part of the cave. The rate in which they were deposited was calculated by the geologist Dr P. Karkanas as being between 0.5 to 1.5cm per century. The conditions prevailing during the formation of these layers did not allow for a frequent and extensive use of the cave, at least not in the aforementioned central area. 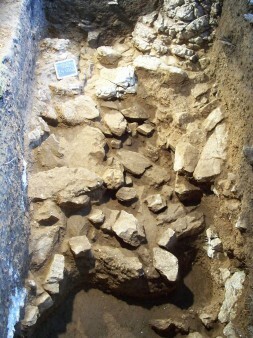 On the other hand, next to the cave’s east walls where the bottom has been uncovered to a depth of almost 3 metres, i.e. 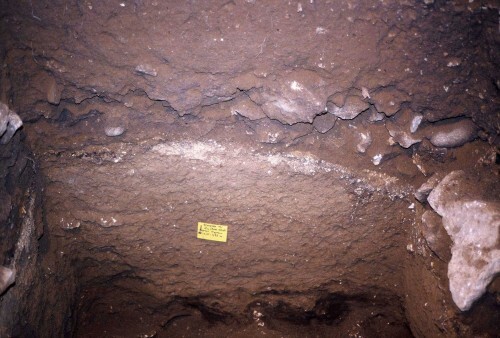 much higher than in the central area, there, the used surface has not been affected by the waters entering each time through the karst conduits, thus leaving the stratigraphy undisturbed. 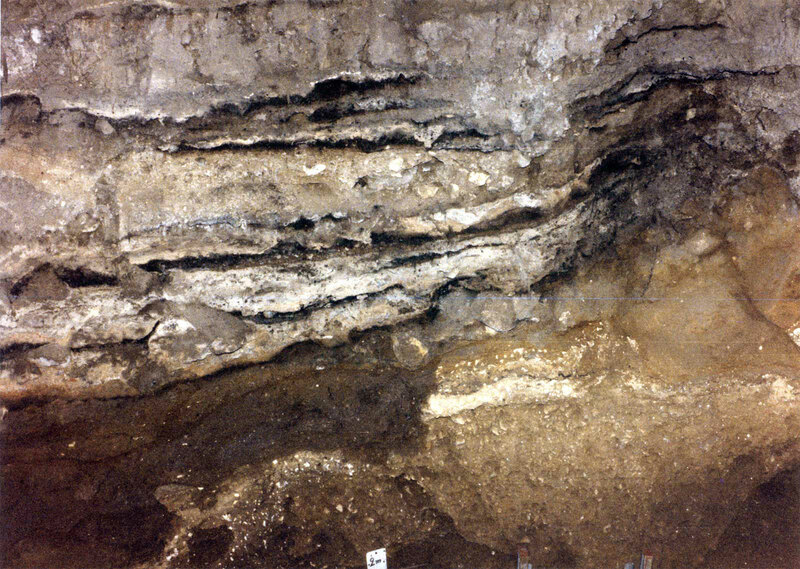 The stratigraphy here in the east part features a large amount of angular limestone gravel coming from the roof and walls of the cave which, combined with the cryogenic deterioration of accompanying sediments, indicates that they are cryoclastic deposits, namely the result of the walls cracking due to the ice’s melting and freezing. The intense and characteristic fires of the central area (figs. 13-14) are absent from this stratigraphy. 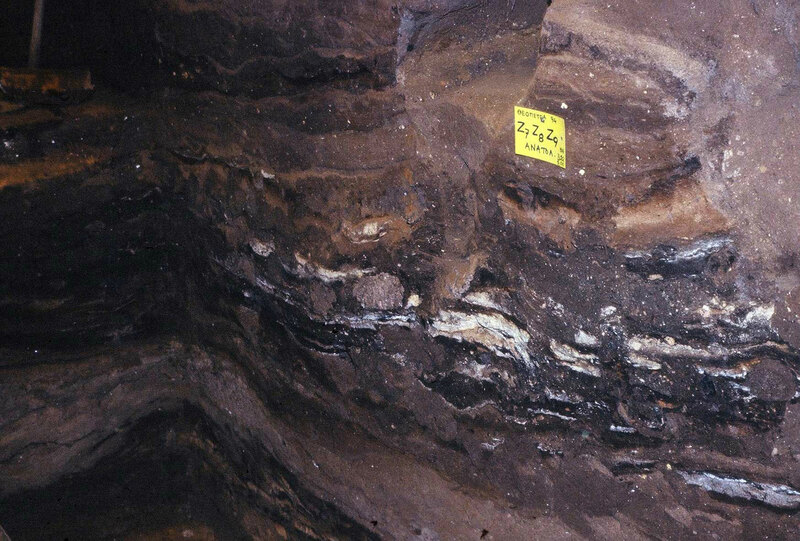 Last, the sediments from this section of the cave also feature huge pits and natural burrows (fig. 14-16) that are usually filled with later, loose deposits. c) The third section features a formation of hard sediment with an overall thickness of almost 1.50 metres that is made up of two superimposed layers (see fig. 6 and figs. 16-18) intersected by a less compact embankment. These hard formations indicate the very cold climate of the last Ice Age with milder conditions in the Middle period (we shall see more information below in the section on Climate). d) The fourth section with a maximum width of approximately 90cm corresponds to the so-called Mesolithic period and is placed in terms of stratigraphy between the hard sediment of the Upper Palaeolothic embankment and the overlying one of the Neolithic period (figs. 17-19). The soil is a sandy fawn colour and has a sandy moist texture while in some areas there are strong residues of fire (figs. 18-21). This layer was not located all over the cave, it is especially not visible in the central area (figs. 3, 9-10) due to deteriorations in the already disturbed upper embankment from aforementioned geophysical factors. 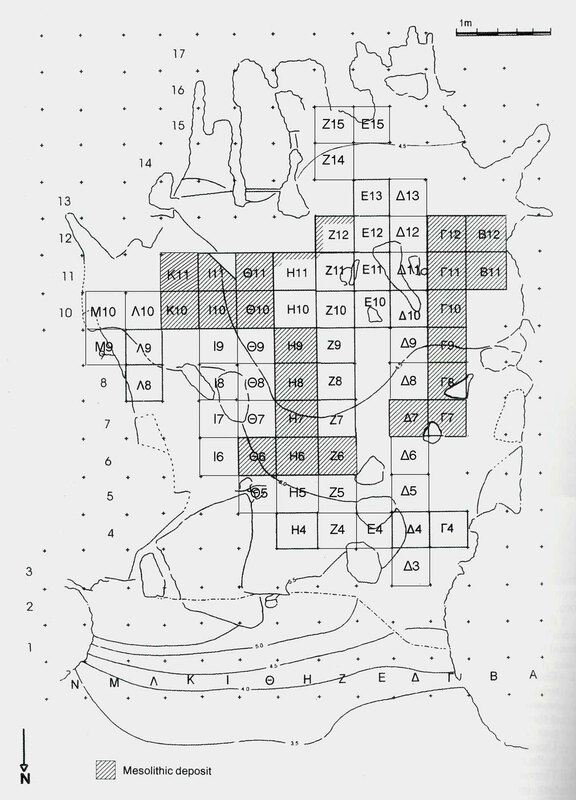 e) The fifth and last section belongs to the Neolithic period and is about 1.50m thick in the central area, that of shaft II on the grid where the layer of stones detached from the roof was located reaching a height of over 2 metres, while it is no higher than 0.50m near the entrance and close to the east walls of the cave (figs. 17, 19, 20, 22). Accordingly, the central embankment, on the one hand was particularly disturbed, for the reasons mentioned above, while it seems on the other hand, undisturbed on the periphery, perhaps because of that area’s more restricted use, owing to its humidity and darkness. As already mentioned, it is confirmed by the shells, bones, charcoal etc. stuck to the cave’s walls as much as 2m above today’s surface of the embankment, that the latter once stood that high. Despite the great disturbance of the upper layers, which can not supply us with a clear Neolithic stratigraphy, nevertheless these have yielded very important finds from all stages of the Neolithic period. During man’s use of the cave it seems that the climate changed repeatedly (Karkanas 2000) with alternative hot and cold spells during which the cave’s population increased or decreased accordingly. 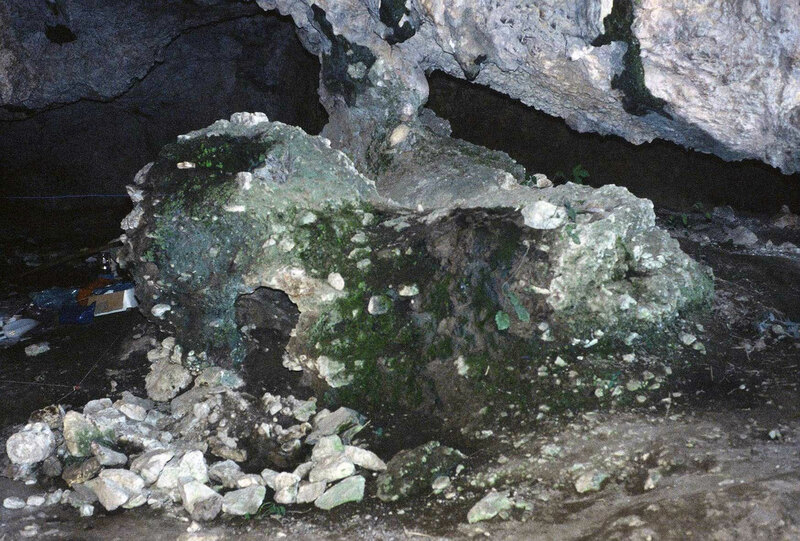 These episodes have left their residues in the Theopetra cave, the only witness of these natural changes in an archaeological site that is, to date, at such a low altitude in Greece, as well as being the southernmost point of Europe with such strong characteristics of glaciers during the Pleistocene period. These can be explained by the cave’s proximity to Pindos and also by the fact that the entrance of the former faces north (fig. 21). The micromorphological examination of samples from all layers (Karkanas & Weiner 2000, Karkanas 2002, Karkanas-Kyparissi 2005) revealed many cold phases imprinted in the sediments: the first on the cave’s lower level is in excess of 130-140,000 years old, the second on the upper layer of the first fire is approximately the age indicated above. An extensive cold phase can be observed during the last glacial (starting after the last mesoglacial of the 5e isotopic stage, almost 130,000 years ago) and lasts up to 18,000 years ago which is considered the end of the last glacial period. Extensive burning appearing in the cave deposits in the form of many outbreaks of fire and dated as being about 60,000 years old (start of isotopic stage 3) reflects a break in the very bad climatic conditions prevailing in the area all through the period of the last glacial outbreak. In an area of about 30 square metres, at least 15 hearths were accounted for, with the number increasing as the excavation expands. These hearths (figs. 22-24) each measuring almost 1 square metre, are made up of a bright red layer, 10-15cm thick on its upper surface, due to its consistency of aluminium oxides, phosphorus and potassium that were subjected to intense heat. Under this red layer in all the hearths there is a black layer that forms their base (figs. 23, 25). 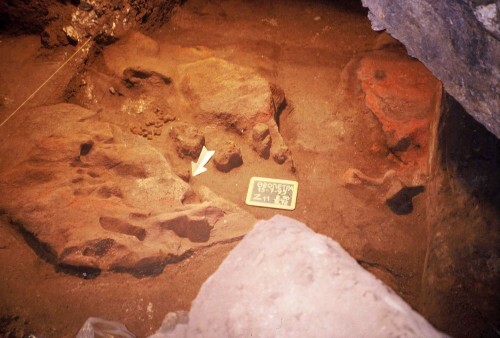 It has been noted that the most important and extensive burning episodes are associated with periods when the climate was milder during which the cave’s population increased. After the Last Glacial Maximum period, 30,000 to 18,000 years ago, the population in the cave seems to have rapidly increased judging from a correspondingly impressive growth of stone tools in these layers. Among the latest findings during the work of the third CSF it is worth noting the discovery, right in front of the cave’s entrance of a heap of stones mainly medium sized, covering all the width of the entrance along with rocks that had obviously fallen from the ceiling and were embedded in the ground (figs. 24, 26). The stones seemed to have been placed there purposely creating a security barrier against both animals entering the cave in times of great cold and against actual extreme weather conditions. 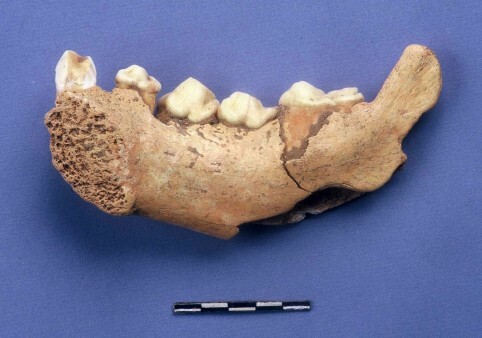 Dating by thermoluminescence gave it an age of 24,000 to 22,000 years old (Zacharias et al. 2012), placing its construction during the Last Glacial Maximum period. Last, about 12,000 years ago, a final brief cold episode called the Younger Dryas, was observed in the cave, certified here for the first time in the Eastern Mediterranean. Due to the cave’s location near the Pindos mountain range it seems that very low temperatures prevailed here at that time. 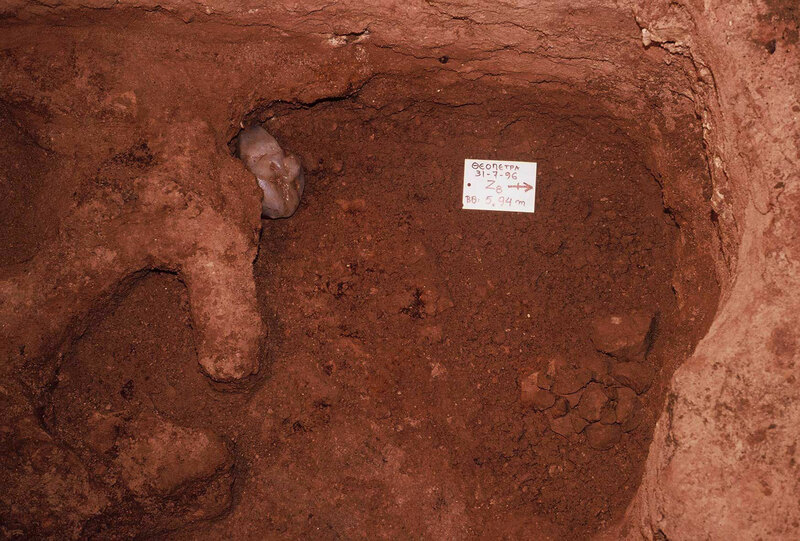 Among the approximately 60,000 year old hearths, tens of usually cylindrical clay formations were found (figs. 25-29) most probably slightly dried rather than baked. They are almost 10cm long and 2.5-3cm thick. Naturally their presence in such early layers caused us confusion as to the period when that clay would have started to be used. In fact, however, according to the stratigraphic observations made by the geologist P. Karkanas, these formations come from the section of the Mesolithic embankment (in the cave they have been preserved indicatively in the place they were found (figs. 27, 30). The latter reached deeper layers through riverbeds and erosions by water caused by the flooding of great volumes of the latter water through the karst conduits in the cave and filled with matter from upper levels. Residue of masses of unbaked clay, apart from the said objects, have been found scattered however up to as far as the deeper levels of the Palaeolithic (figs. 28, 31) that also originate from the Mesolithic embankment. 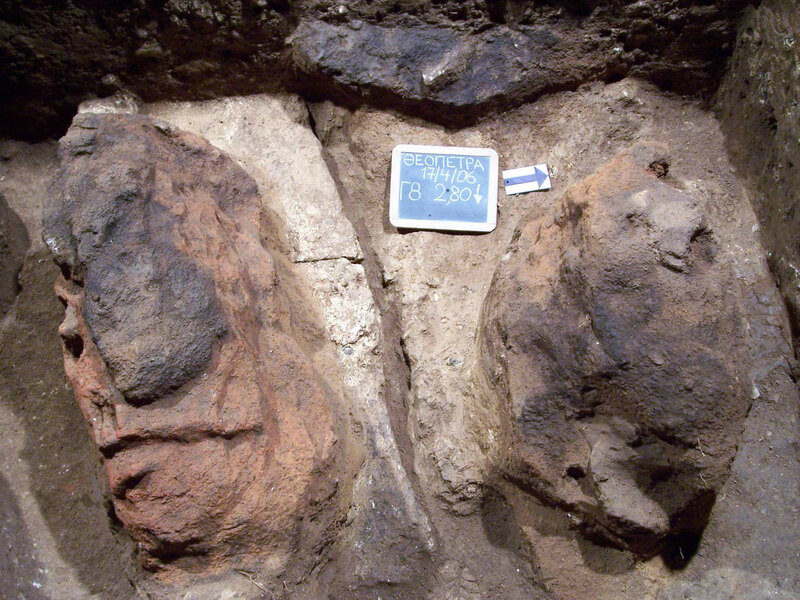 These clay formations certainly represent early attempts to create a pliable material such as clay, whose properties, it seems, were already known by the Mesolithic period and are proof that the technology of ceramics was mastered indigenously since combined with the baking of clay some centuries later, it marked the revolution of technology in the Neolithic age. Towards the end of the Palaeolithic, residues of unshaped clay were also found near the hearths (figs. 29, 32). This sample was carbon dated as belonging to 13480-12320 B.C. / 12539±200 ΒΡ (DEM-208). 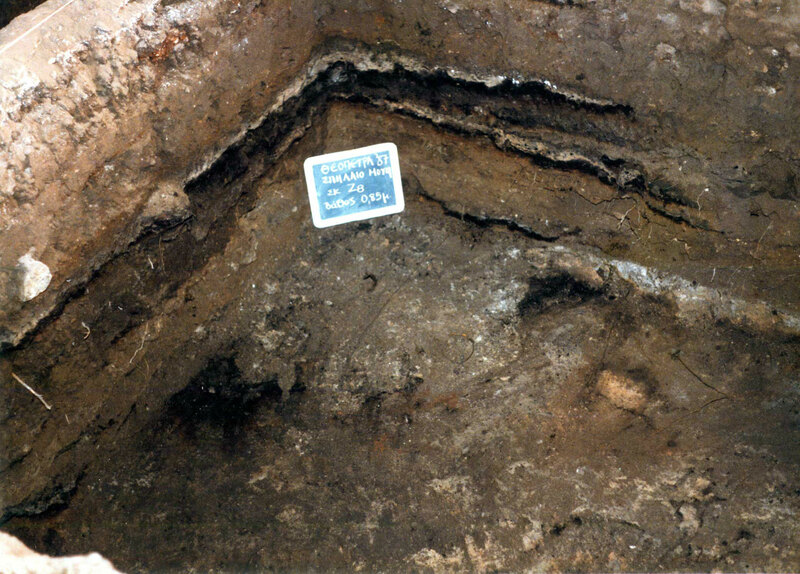 This combination is not found in deeper layers, so the existence of clay, even in shapeless masses, towards the end of the Upper Palaeolithic period naturally makes it necessary to re-examine the issue of an indigenous or imported ceramics technology in Greece at the start of the Neolithic period. 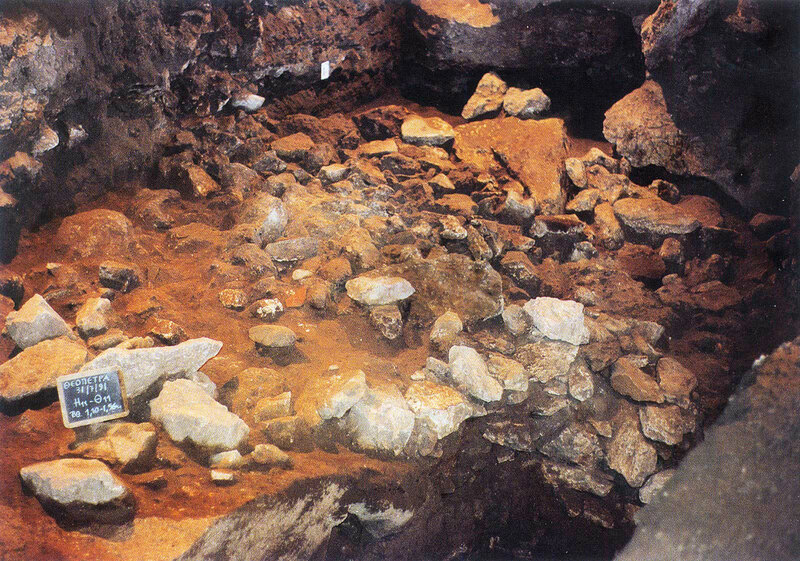 A great problem we faced in the excavation was the almost entire absence of bones in the Palaeolithic embankments in all the cave’s central area, that could not be archaeologically interpreted until the micromorphological study of colleague geologist Dr P. Karkanas (Karkanas and Winer 2000) with sediment analyses carried out at the Weizmann Institute in Israel, attributed the absence of bones to the phenomenon of diagenesis. 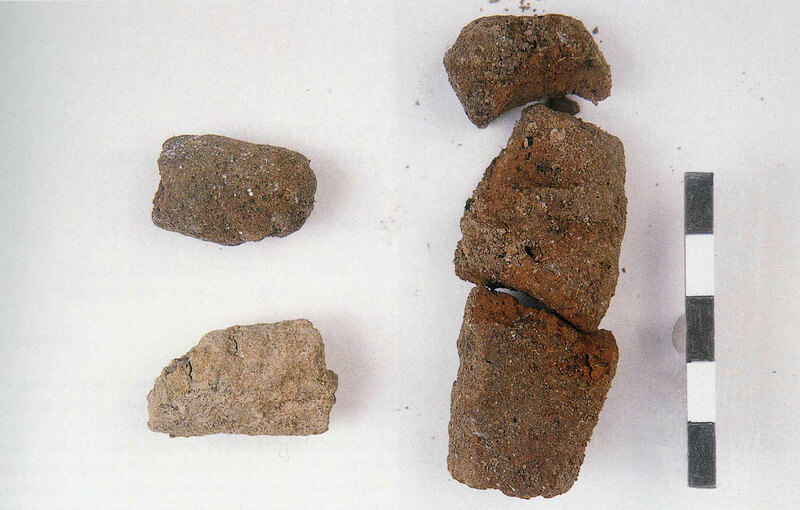 This means post-depositing procedures related to the composition of sediments from the residue of wood burning that contain calcium carbonate, pellets, amorphous silicate pellets and dissolved phosphorus from the decomposition of organic waste, with which the water circulating in the sediments’ pores is enriched. The mineral apatite is thus created, the principle inorganic component of bones, and then a set of authigenic minerals is created. As a result, in the course of diagenesis, the apatite mineral is transformed into other more complex phosphate minerals of aluminium and this stage marks the dissolving of apatite in the bones. Thus in areas of the cave where apatite or calcite is found, bones are a stable presence giving a true picture of their presence in the past while in the areas with the complex phosphate minerals, their absence incorrectly indicates that they did not exist in the past. Bones are absent from the Theopetra cave’s central area because, as mentioned before, this is where the karstic conduits of the southern area end up. These repeatedly transferred large quantities of water from outside the cave flooding its interior and contributing to bone dissolution through the process of diagenesis mentioned above (figs. 30, 33). We are very lucky that the area near the cave’s east walls, also close to the end of a karst conduit but clearly higher up, stayed clear of the water. It was there that very well preserved animal bones were found (figs. 30, 34) as well as two human burials of the Upper Palaeolithic that we shall see below. It is very probable that the type of human living in the area changed over the thousands of years the cave was in use. From the data so far from other places in Europe we know the man Homo sapiens neanderthalensis disappears sometime around 40,000 years ago and modern man Homo sapiens sapiens makes his appearance, while in the Middle East modern man had already appeared almost 100,000 years ago before today. 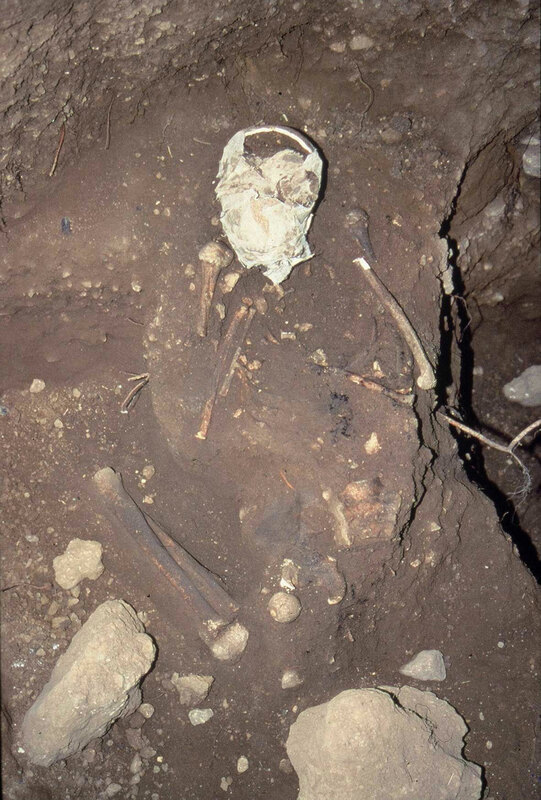 So far, in Theopetra we were lucky to have found five human skeletons one from the Upper Palaeolithic period whose bones date it to 14990-14060 years BC (figs. 31, 35) (Fakorellis and Maniatis 2000, DEM -241), i.e after the end of the Last Maximum Glacial period. Another skeleton probably contemporary with the first was adjacent to it and at approximately the same depth, but due to the bad bone condition no collagen survived to reveal its age (figs. 32, 36). 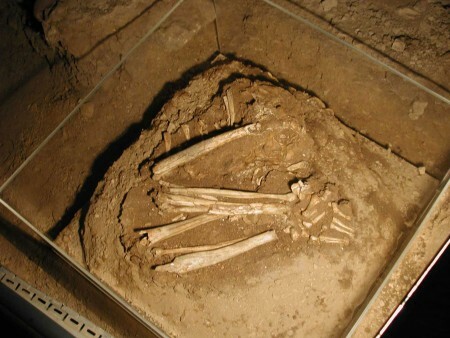 Three more burials belong to the Mesolithic period and have been dated to approximately/about 7000-7500 BC ((Kyparissi-Apostolika 2003, 8.070±60 ΒΡ, 7280-6830 ΒC, CAMS -21773) and 8450±45 ΒΡ (7.586-7384 BC, oxa-17352) (figs. 33-35, 37-39). 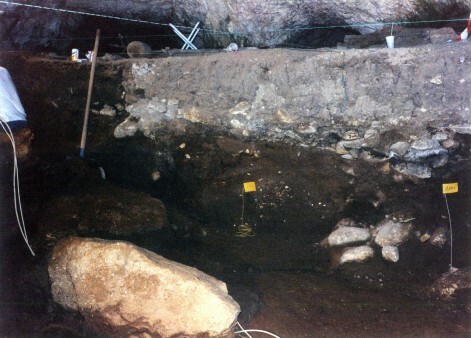 The two last Mesolithic burials were found during enhancement works done to the cave in the summer of 2006 and January 2008. One of those found in a folded position, is exhibited in the cave in the spot it was found, protected by a plexiglass case (Kyparissi-Apostolika forthcoming). 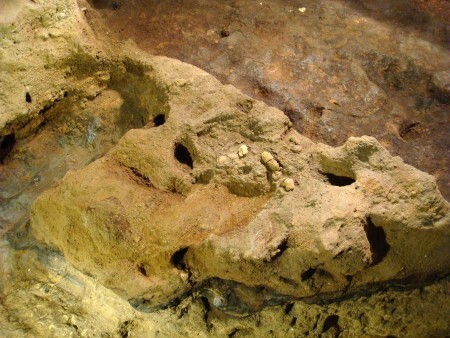 Apart from the actual burials, human footprints were found in the cave’s deeper layer of fire (Manolis et al. 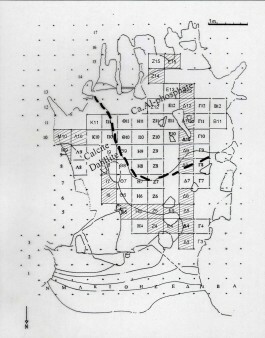 2000) (fig. 36, 40) belonging to layers of the Middle Palaeolithic period -they had been carbon dated to 46.330±1.590 ΒΡ (Fakorellis and Maniatis 2000, DEM -613) while dating with thermoluminescence, as already mentioned, raises their age to 110-135,000 years old! (Valladas et al. 2007). 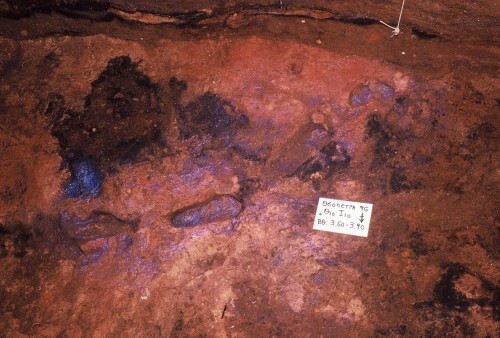 Given the age of the layer where the footprints were found and because of the Mousteri (Middle Palaeolithic) technology of the stone tools found in the corresponding layer and generally attributed to the Neanderthals (Panagopoulou 2000), the footprints can be reasonably attributed to the earlier type of man Homo sapiens neanderthalensis. Or, if they belong to modern man, it means that the latter arrived in Greece much earlier than the rest of Europe i.e. about the same as the Middle East. Ultimately, to whatever human type these footprints belong, their discovery is particularly important. We hope that they will contribute to the study of the presence and evolution of man in Greece which is situated between Europe and the Middle East making it also possible that modern man appeared much earlier here than in the rest of Europe. These findings are unique in Greece and extremely rare worldwide. 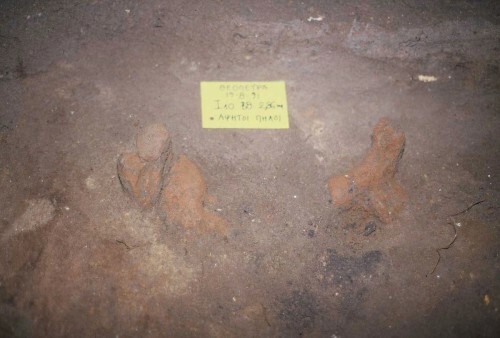 They are the second most ancient footprints in Europe after those of Terra Amata in France which are 380,000 years old while others found in caves in France and Italy are under 20,000 years old. The footprints are up to 15cm long and about 6cm wide which fits a child today of about 4 to 5 years old. Calculating their age resulted from comparing them with the feet of today’s children of that same age group, then making a photogrammetric analysis and scanning with a laser (figs. 37, 41) (Manolis et al. 2000). From the length of the sole it is possible to estimate the individual’s height (15%). In this case, it is estimated that the individuals owning the more clearly visible 2nd and 3rd footprint, had a height of 94-100cm and 86-92cm respectively. (The footprints belong to different individuals). 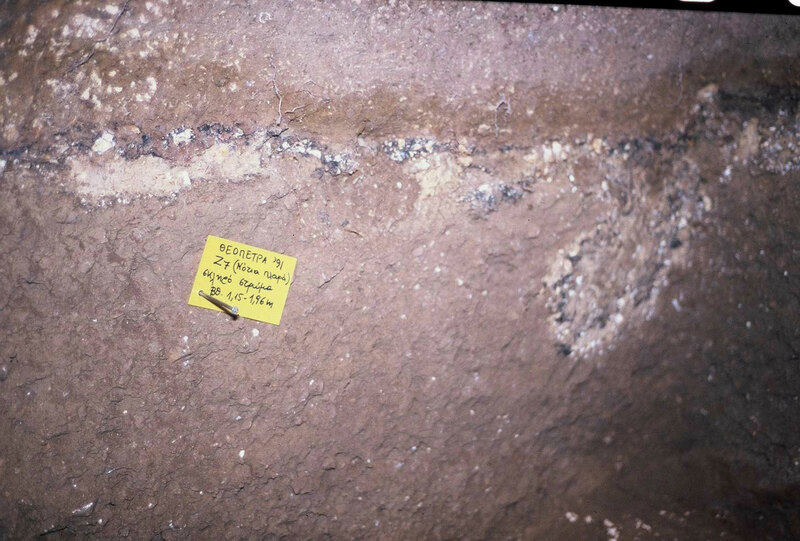 It may be, however, that these do not correspond to the age mentioned previously, given that all the sediments in the cave have shrunk, possibly making the size of these footprints look smaller. 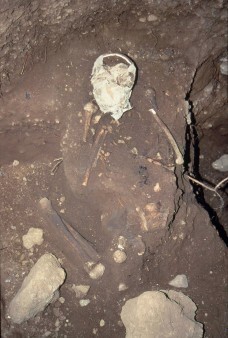 Last, even though no in situ burials have been located in the Neolithic embankment, several skeletal remains have been found, bringing the estimate of the cave’s population during that period to about 43 people (babies, children and adults). 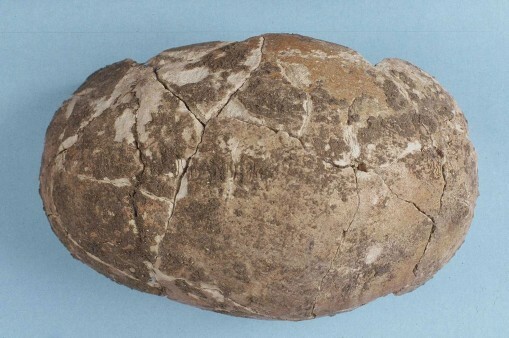 A palaeopathological study was made, various injuries were found, but on the whole it seems to have been a robust population (Stravopodi and Manolis 2000, Stravopodi 2012) who lived mainly off the earth thus pointing to an agricultural and livestock economy with the occasional consumption of meat and even less fish protein due to Theopetra’s distance from the sea (Papathanasiou 2000). It is also worth noting that DNA analyses carried out both on the bones of a Palaeolithic skeleton and on later bones showed a clear genetic link between them (Εvison et al. 2000). As mentioned above, the phenomenon of diagenesis in the central area dissolved the bones almost in their entirety. 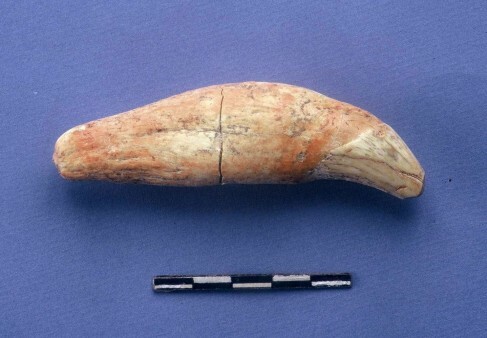 But, thanks to the east area that was unaffected by this process, it was possible to identify bones of animals (figs. 38, 39, 42, 43) such as the cave bear, as well as goats, red deer, roe deer, foxes, badgers, bears, hares, hyenas, wolves, tortoises, ducks, partridge et al and fowl such as pidgeons, crows, eagles etc which correspond to the Palaiolithic and Mesolithic embankment (Rowley-Conwy και Νewton 2000). Moreover, from the findings on the banks of the river Pineios during the investigations of Milojcic (Milojcic et al. 1965) it has been confirmed that during the warm periods of the Palaiolithic era, elephants, rhinos, hippos, horses and varieties of ruminants were present in Thessaly. 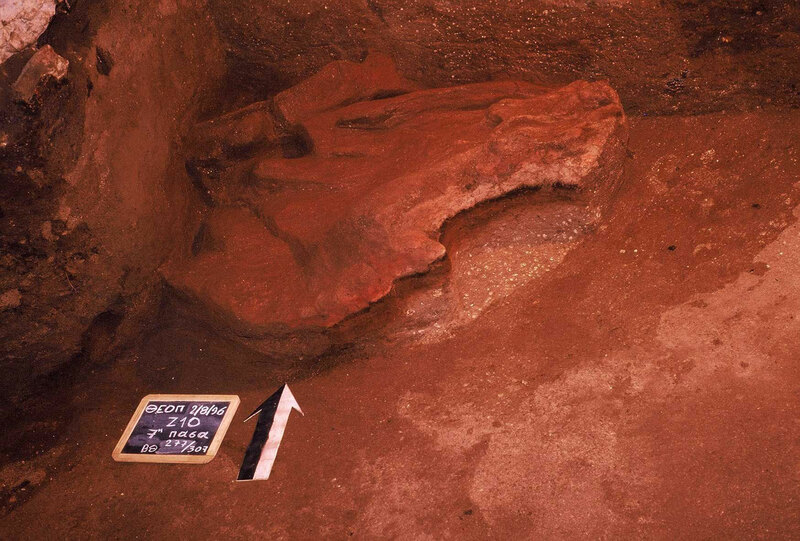 From the Neolithic embankment, the bones of many animals were recognized, such as sheep which are the dominant species by about 60%, cattle, domesticated dogs and pigs, also around 11% of wild animals, the products of hunting such as various species of deer, boar, bear, hare, wild cat and badger (Hamilakis 2000). 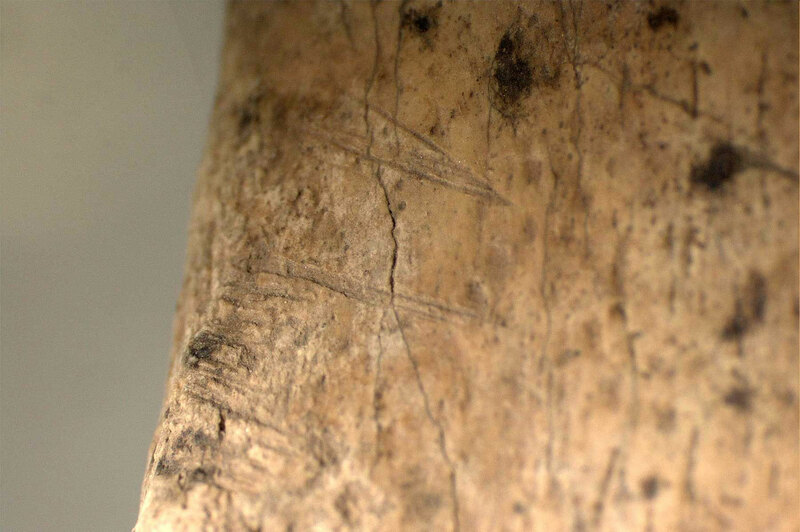 On the bones of a bear dating from the Neolithic period, towards the end of the 5th millennium (DEM 1968/ 5,441±30 BP/ 4,350-4,240 BC) were found traces of knife wounds attributed to an attempt at cutting up the animal (figs. 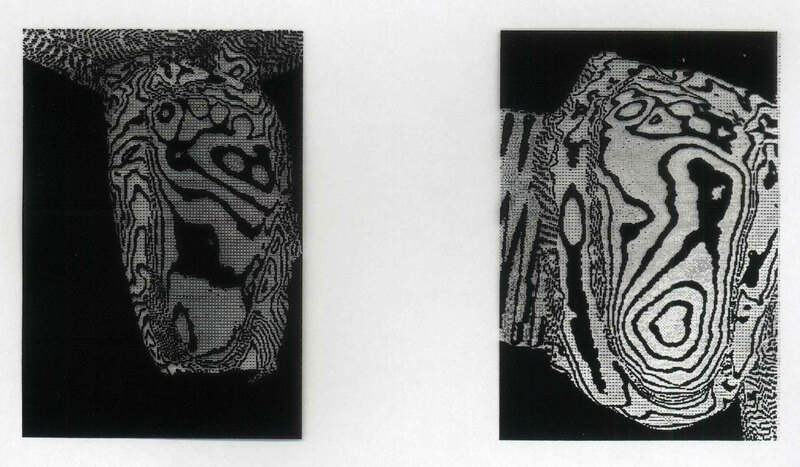 39, 44) ) (Hamilakis & Harris forthcoming). 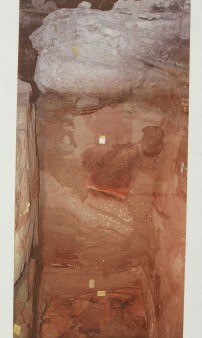 Since 1987, the Theopetra cave is being excavated continuously by the Ephorate of Palaeoanthroplogy and Speleography headed by the writer and is being studied with the collaboration of a large multidisciplinary team made up of anthropologists, biologists, archaeologists specializing in stonework, archaeobotany, anthracology (science dealing with carbons), geologists, archaeometrists for dating carbon and burned matter, archaeozoologists and scientists from other fields mainly environmental as new ones are constantly springing up. As an excavator I feel very lucky to have been given this opportunity, but without the presence, all these years of my colleagues from different fields, its completion would not have been possible or at least the same result would not have been achieved regarding the interpretation on the finds and the use of space. 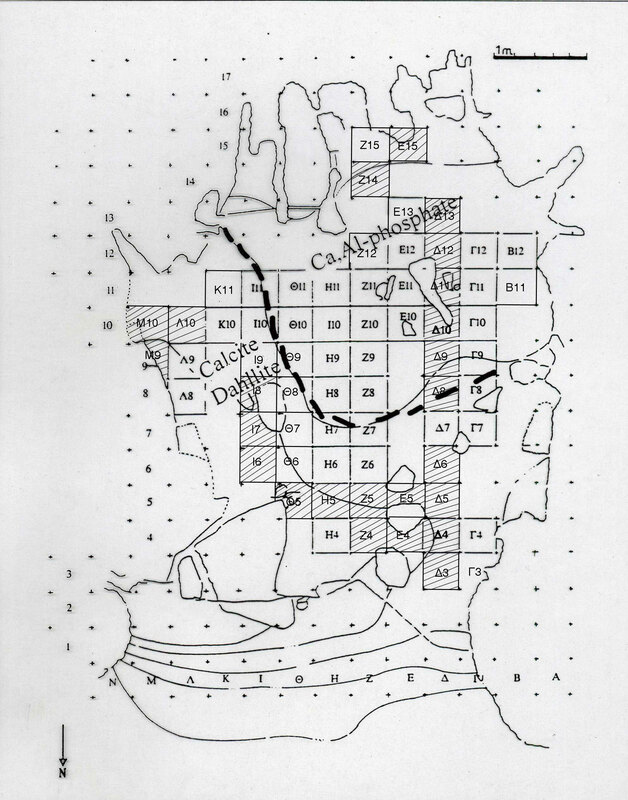 The climate for example, played a key part in the use of space, the frequency with which the place was inhabited or the almost total absence of humans at some time. 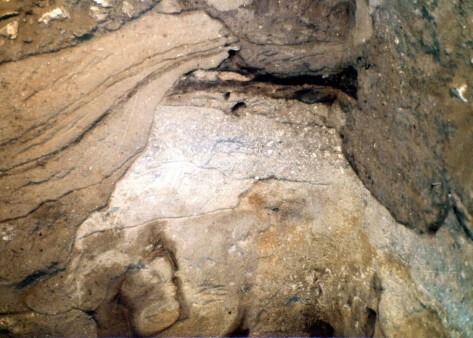 The cave’s frequent flooding with water, preventing its use by humans, combined with fires that literally wiped out traces of bones from specific areas, creating a false archaeological picture, could not have been interpreted by archaeologists alone without the decisive help from my colleague geologist Dr P. Karkanas to whom I am deeply grateful for his great contribution to the research. I would also like to thank the Weizmann Institute of Israel and Professor Steven Weiner as well as professor Ofer Bar-Yosef from Harvard University for giving us relevant experience from excavations in the caves of Israel and allowed us the use of the Institute laboratories for related analyses. The study and analyses of sediments were further helped by the searching and identifying of phytoliths by Dr Georgia Tsartsisdou that confirm the presence of humans in the cave and in the deeper sediments before the use of fire. 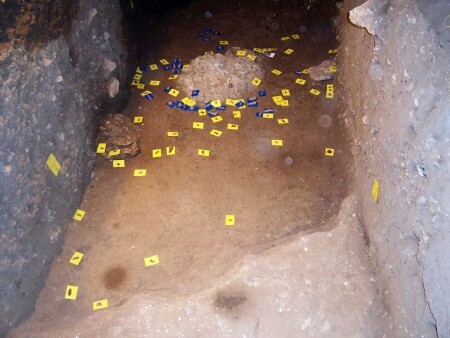 Anthropological studies as well as the actual discovery of the tombs were successful each time thanks to the presence and responsible study by Dr Eleni Stravopodi. The study of the human footprints was undertaken by Dr Sotiris Manolis who with the collaboration of Dr Leslie Aiello and Dr Robin Henessy from University College London carried out all the required analyses so as to reach the right conclusions. Dr Martin Evison and his colleagues from Sheffield University, England dealt with the analysis and study of DNA from skeletal remains and the search for the genetic affinity of the population. Dr Christina Papageorgopoulou from the Democritus University of Thrace, recently started to research DNA mainly in Mesolithic skeletons with already impressive results. Dr Anastasia Papathanasiou completed the team of anthroplogists with a study on nutrition that she did on the actual skeletons. 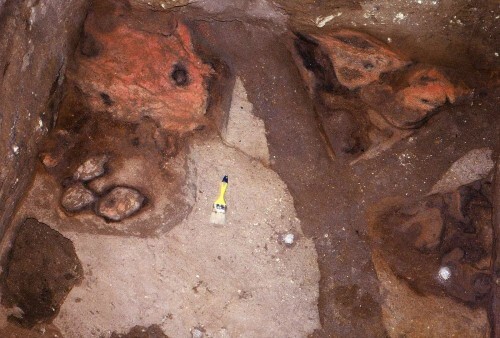 The Palaeolithic and Mesolithic bones of fauna were studied by Dr. Peter Rowley-Conwy and Dr. Sally Newton, while those of the Neolithic period by Dr Yiannis Hamilakis and Dr Kerry Harris from Southampton Univesity – Dr Katerina Papagianni studied the microfauna from all the periods while the remains of mainly fresh water fish and shellfish were studied by Dr Tatiana Theodoropoulou. The fauna material resulting from the latest excavations for the enhancement projects will be studied by Dr Katerina Trandalidou. I am deeply grateful to them all. * 95 publications have been made to date on the Theopetra Cave by the excavator and her colleagues and they continue with separate material, while the first volume on the Neolithic period is in its final stage before publication. Αδάμ Ε., 2000. «Οι Ανώτερες Παλαιολιθικές και Μεσολιθικές λιθοτεχνίες του σπηλαίου Θεόπετρας και η συμβολή τους στην εκτίμηση της χρήσης του σπηλαίου κατά το Τελικό Πλειστόκαινο», in Κυπαρίσση-Αποστολίκα Ν. (ed. ), Σπήλαιο Θεόπετρας: Δώδεκα Χρόνια Ανασκαφών και Έρευνας 1987-1998, Minutes of International Conference, Trikala, 6-7 November 1998, Athens, pp. 163-171. Aποστολίκας Ο., 2014. «Προϊστορική εκμετάλλευση του οροπεδίου της Λίμνης Πλαστήρα», Doctoral thesis, Αριστοτέλειο Πανεπιστήμιο Θεσσαλονίκης. 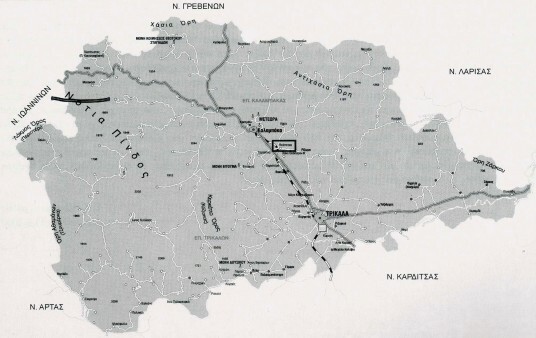 Bottema S., 1979. «Pollen analytical investigations in Thessaly (Greece)», Palaeohistoria 21, pp. 19-40. Εvison M., Kyparissi-Apostolika N., Stravopodi E., Fieller N. and D. Smilie, 2000. «An ancient HLA type from a palaeolithic skeleton from Theopetra cave, Greece», in Κυπαρίσση-Αποστολίκα Ν. (ed. ), Σπήλαιο Θεόπετρας: Δώδεκα Χρόνια Ανασκαφών και Έρευνας 1987-1998, Minutes International Conference, Trikala, 6-7 November 1998, Athens, pp. 109-117. Θεοχάρης Δ.Ρ., 1967. H αυγή της Θεσσαλικής Προϊστορίας, ΄Εκδοση της Φιλαρχαίου Εταιρείας Βόλου, Volos. 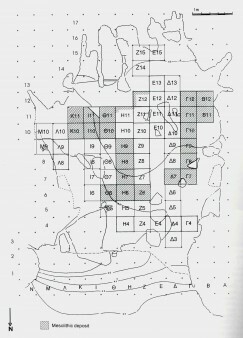 Facorellis Y., Kyparissi-Apostolika N., Maniatis Y., 2002. The Cave of Theopetra, Kalambaka: Radiocarbon Evidence for 50,000 Years of Human Presence, 2001 by the Arizona Board of Regents on behalf of the University of Arizona, Radiocarbon 43/28, pp. 1029-1048. Facorellis Y., Karkanas P., Higham, Th., Brock F., Ntinou M. and Kyparissi-Apostolika N., 2013. «Interpreting Radiocarbon dates from the Palaeolithic layers of Theopetra cave in Thessaly, Greece», Radiocarbon 55/2-3, pp. 1432-1442. Ζαχαριάς Ν., Κυπαρίσση-Αποστολίκα Ν. and Μπασιάκος Ι., 2012. «Χρονολογήσεις με οπτική φωταύγεια ιζημάτων της εισόδου του σπηλαίου της Θεόπετρας», in Ν. Ζαχαριάς, Μ. Γεωργακοπούλου, Κ. Πολυκρέτη, Γ. Φακορέλλης and Θ. Βάκουλης (eds), Proceedings of the 5th Symposium of Greek Archaeometric Society, Athens 8-10 October 2008, Eκδόσεις Πανεπιστημίου Πελοποννήσου, Σειρά «Ανθρωπιστικές Επιστήμες», Εκδόσεις Παπαζήση, Athens, pp. 137-144. Hamilakis Y., Harris K. (forthcoming. ), «Humans and other animals at Neolithic Theopetra», in N. Kyparissi-Apostolika (ed. ), Theopetra Cave: the Neolithic period. Jacobsen T.W., 1976. «17,000 years of Greek prehistory», Scientific American 234, pp. 76-87. Kαρκάνας Π., 2000. «Θεόπετρα: ένα σπήλαιο δίνει πληροφορίες για την εξέλιξη του κλίματος», National Geographic 4/4 (April 2000), pp. 136-139. Kαρκάνας Π. and Weiner S., 2000. «Λιθοστρωματογραφία και Διαγένεση των αποθέσεων του σπηλαίου Θεόπετρας Καλαμπάκας», in Κυπαρίσση-Αποστολίκα Ν. (ed. ), Σπήλαιο Θεόπετρας: Δώδεκα Χρόνια Ανασκαφών και Έρευνας 1987-1998, Minutes of International Conference, Trikala, 6-7 November 1998, Athens, pp. 37-51. Κarkanas P., 2002. «Micromorphological Studies of Greek Prehistoric Sites: New Insights in the Interpretation of the Archaeological Record”, Geoarchaeology 17/3, pp. 237-259. Κατσαρού Σ., 2000. «Η μονόχρωμη κεραμική της Νεολιθικής ως προϊόν μιας διαδικασίας επιλογής. Η περίπτωση του σπηλαίου Θεόπετρας», in Κυπαρίσση-Αποστολίκα Ν. (ed. ), Σπήλαιο Θεόπετρας: Δώδεκα Χρόνια Ανασκαφών και Έρευνας 1987-1998, Minutes of International Conference, Trikala, 6-7 November 1998, Athens, pp. 235-261. Κυπαρίσση-Αποστολίκα Ν., 2000. «Η ανασκαφή του σπηλαίου Θεόπετρας 1987-1998», in Κυπαρίσση-Αποστολίκα Ν. (ed. ), Σπήλαιο Θεόπετρας: Δώδεκα Χρόνια Ανασκαφών και Έρευνας 1987-1998, Minutes of International Conference, Trikala, 6-7 November 1998, Athens., pp. 17-36. Κυπαρίσση-Αποστολίκα Ν., 2000α. «Η Νεολιθική περίοδος του σπηλαίου Θεόπετρας», in Κυπαρίσση-Αποστολίκα Ν. (ed), Σπήλαιο Θεόπετρας: Δώδεκα Χρόνια Ανασκαφών και Έρευνας 1987-1998, Minutes International Conference, Trikala, 6-7 November 1998, Athens, pp. 181-234. Kyparissi-Apostolika N., 2003. «The Mesolithic of Theopetra cave: new data for a debated period of Greek Prehistory», in N. Galanidou and C. Perlès (eds. ), The Greek Mesolithic-Problems and Perspectives, British School at Athens Studies 10, pp. 189-198. Κυπαρίσση-Αποστολίκα N. and Kαρκάνας Π., 2005. «Η συμβολή της γεωλογικής παρατήρησης στην αρχαιολογική ερμηνεία του σπηλαίου Θεόπετρας», in Σταγέας Γ. (ed. ), Πρακτικά Β΄ Ιστορικού Συνεδρίου Καλαμπάκας (10-12.5.2002), εκδ. Γένεσις, Kalambaka, pp. 581-590. Kyparissi-Apostolika Ν., 2006. 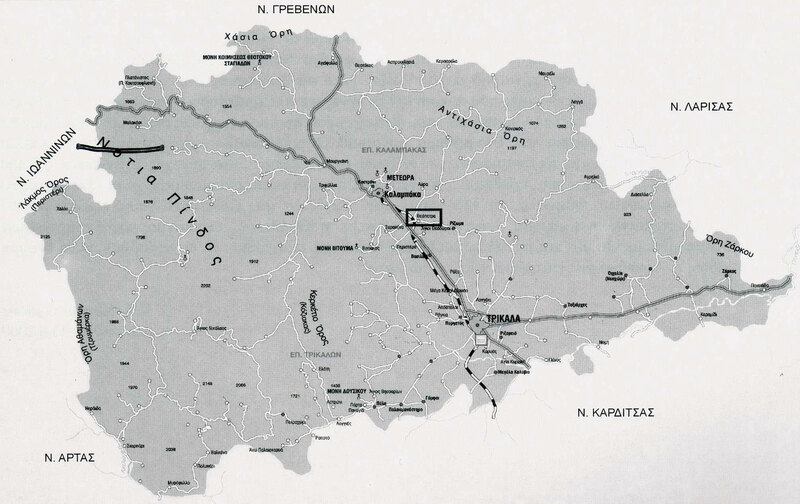 The Beginning of the Neolithic in Thessaly, in I. Gatsov and H. Schwarzberg (eds. ), Aegean – Marmara – Black Sea: The present state of Research on the Early Neolithic, Proceedings of the Session held at the EAA 8th Annual Meeting at Thessaloniki, 28 September 2002, Schriften des Zentrums fűr Archaeologie und Kulturgeschichte des Schwarzmeerraumes 5, Beier & Beran, Langenweissbach 2006, pp. 59-67. Kyparissi-Apostolika Ν. (forthcoming). 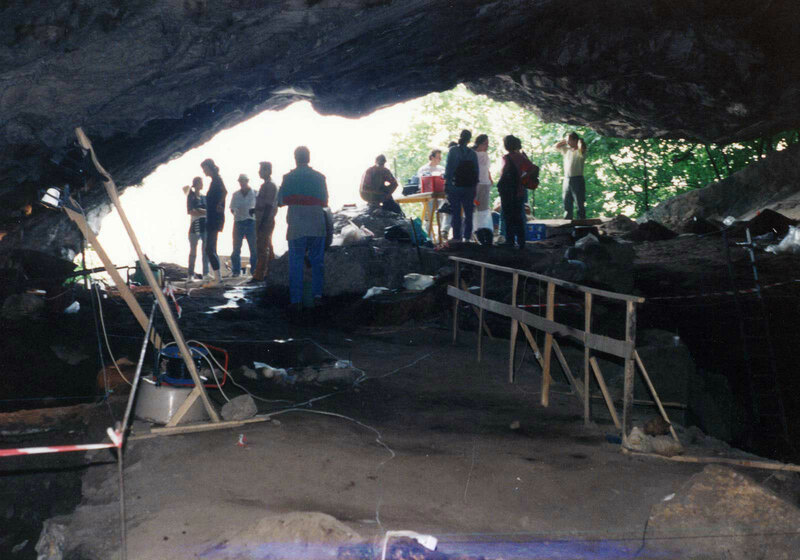 «The role of Theopetra cave in Thessaly, Greece, at the end of the Neolithic: Habitual or Symbolic use?», International Conference Communities in Transition: The Circum-Aegean Later Neolithic stages (ca. 5000/4800-3200/3000 BC), Athens 7-9 June 2013. Kυπαρίσση-Αποστολίκα Ν. (forthcoming), «Προϊστορικές ταφές στο σπήλαιο της Θεόπετρας», Αφιερωματικός τόμος για τον Νίκο Ξηροτύρη, Πανεπιστήμιο Κομοτηνής. Mανώλης Σ., Αiello L., Henessy R. and Κυπαρίσση-Αποστολίκα Ν., 2000. «Αποτυπώματα ποδιών Μέσης Παλαιολιθικής από το σπήλαιο Θεόπετρας (Καλαμπάκα, Θεσσαλία)», in Κυπαρίσση-Αποστολίκα Ν. (ed. ), Σπήλαιο Θεόπετρας: Δώδεκα Χρόνια Ανασκαφών και Έρευνας 1987-1998, Proceedings of International Conference, Trikala, 6-7 November 1998, Athens, pp. 81-93. Milojčič V., Boessneck J., Jung D. and Schneider H., 1965. Paläolithikum um Larissa in Thessalien, Rudolf Habelt Verlag, Bonn. Ντίνου Μ., 2000. «Προκαταρκτικά αποτελέσματα της ανθρακολογικής ανάλυσης από το σπήλαιο Θεόπετρας», in Κυπαρίσση-Αποστολίκα Ν. (ed. ), Σπήλαιο Θεόπετρας: Δώδεκα Χρόνια Ανασκαφών και Έρευνας 1987-1998, Proceedings of International Conference, Trikala, 6-7 November 1998, Athens, pp. 69-80. Ntinou M. and Kyparissi-Apostolika N., 2008. 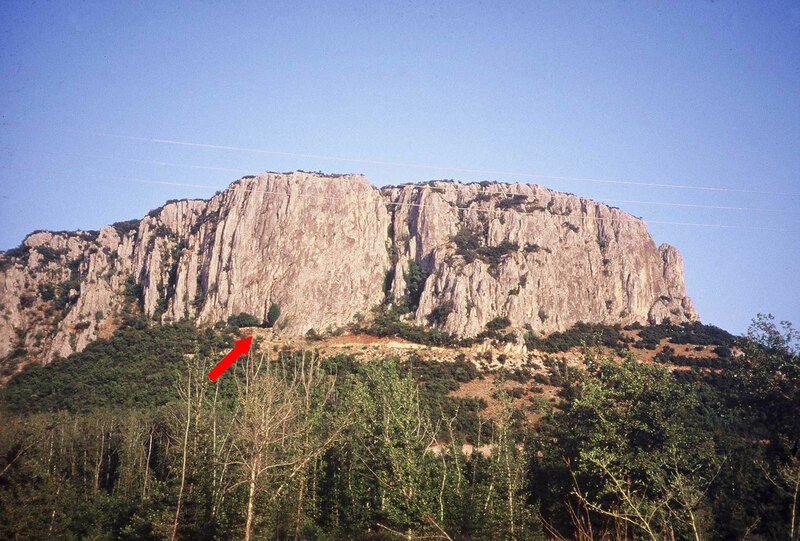 «The Pleistocene-Holocene charcoal record from Theopetra cave, Thessaly, Greece: implications for vegetation, climate and human use», in Damblon, F. and Court-Picon, M. (eds. ), Charcoal and microcharcoal. Continental and marine records. Abstracts and Programme 4th International Meeting of Anthracology, Brussels 8-13 September 2008, Geological Survey of Belgium Professional Papers 303, pp. 1-105. Ntinou M. and Kyparissi-Apostolika N. (to be submitted for publication in Vegetation History), «Local vegetation dynamics and human habitation from the Last Interglacial to the Early Holocene at Theopetra Cave, central Greece: evidence from wood charcoal analysis». Παναγοπούλου Ε., 2000. «Τα Μέσα Παλαιολιθικά εργαλειακά σύνολα του σπηλαίου Θεόπετρας: Συμβολή στη μελέτη των τεχνολογικών μεταβολών κατά το Ανώτερο Πλειστόκαινο», in Κυπαρίσση-Αποστολίκα Ν. (ed. ), Σπήλαιο Θεόπετρας: Δώδεκα Χρόνια Ανασκαφών και Έρευνας 1987-1998, Proceedings of International Conference, Trikala, 6-7 November 1998, Athens, pp. 139-161. Papathanasiou A., 2000. 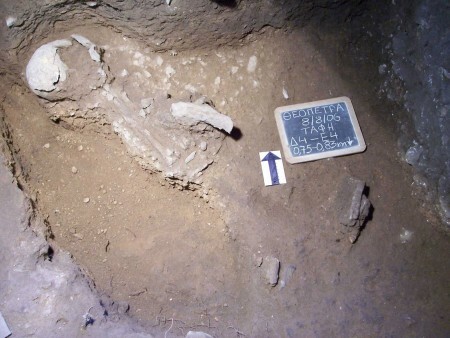 «The reconstruction of the Theopetra cave population diet from stable isotope analysis of human bones», in Κυπαρίσση-Αποστολίκα Ν. (ed. ), Σπήλαιο Θεόπετρας: Δώδεκα Χρόνια Ανασκαφών και Έρευνας 1987-1998, Proceedings of International Conference, Trikala, 6-7 November 1998, Athens, pp. 119-127. Perlès C., 1988. «New Ways with an Old Problem: Chipped Stone Assemblages as an Index of Cultural Discontinuity in Early Greek Prehistory», in E.B. French and Wardle K.A. (eds. ), Problems in Greek Prehistory, Bristol, pp. 477-488. Perlès C., 1990. Les industries lithiques taillées de Franchthi (Argolide, Grèce), vol. 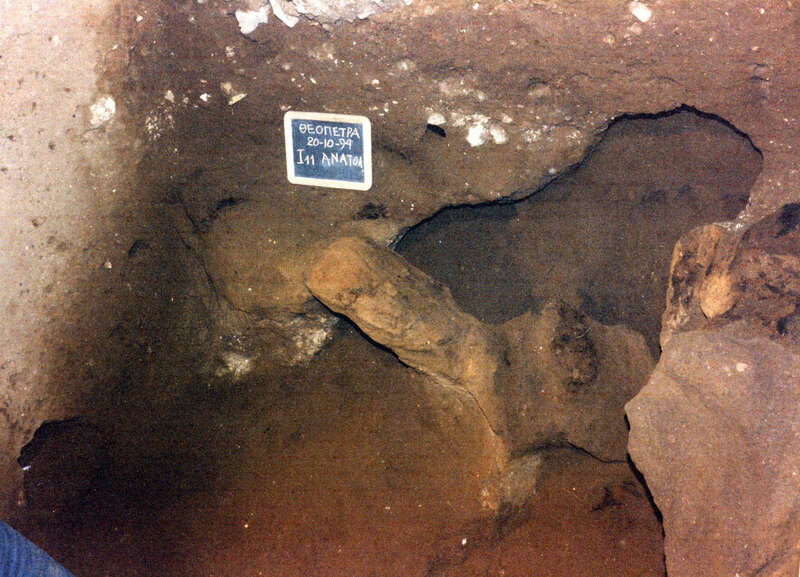 II: Les industries du Mésolithique et du Néolithique Initial [Excavations at Franchthi Cave, Greece, τεύχος 5], Indiana University Press, Bloomington and Indianapolis. Rowley-Conwy P. and Newton S., 2000. 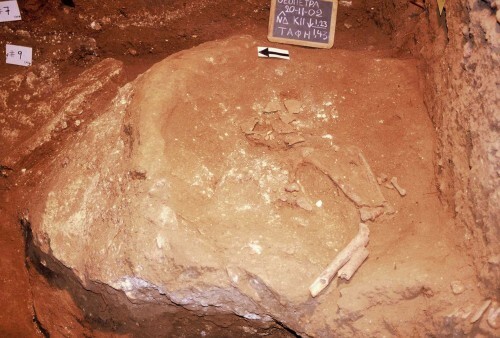 «Late Palaeolithic and Mesolithic animal bones from Theopetra cave», in Κυπαρίσση-Αποστολίκα Ν. (ed. ), Σπήλαιο Θεόπετρας: Δώδεκα Χρόνια Ανασκαφών και Έρευνας 1987-1998, Proceedings of International Conferenece, Trikala, 6-7 November 1998, Athens, pp. 129-134. Runnels C., 1988. «A prehistoric survey of Thessaly: New light on the Greek Middle Palaeolithic», Journal of Field Archaeology 15, pp. 277-290. Σκουρτοπούλου Κ., 2000. «Η επεξεργασία απολεπισμένου λίθου στο σπήλαιο Θεόπετρας κατά τη διάρκεια της Νεολιθικής εποχής», in Κυπαρίσση-Αποστολίκα Ν. (ed), Σπήλαιο Θεόπετρας: Δώδεκα Χρόνια Ανασκαφών και Έρευνας 1987-1998, Proceedings of International Conference, Trikala, 6-7 November 1998, Athens, pp. 269-292. Στραβοπόδη Ε. and Σ. Μανώλης, 2000. «Το βιοαρχαιολογικό προφίλ των ανθρωπολογικών ευρημάτων του σπηλαίου Θεόπετρας: ένα πιλοτικό πρόγραμμα στον ελλαδικό χώρο», in Κυπαρίσση-Αποστολίκα Ν. (ed. ), Σπήλαιο Θεόπετρας: Δώδεκα Χρόνια Ανασκαφών και Έρευνας 1987-1998, Proceedings of International conference, Trikala, 6-7 November 1998, Athens, pp. 95-108. Στραβοπόδη Ελένη, 2012. «Το παλαιοπαθολογικό προφίλ της πορώδους υπερόστωσης ως επιδημιολογικής έκρηξης στις κοινωνίες του πρώιμου Ολόκαινου στον Ελλαδικό χώρο: μία βιοπολιτισμική προσέγγιση». Doctoral thesis, Τομέας Φυσιολογίας Ζώων και Ανθρώπου, Τμήμα Βιολογίας, Εθνικό και Καποδιστριακό Πανεπιστήμιο Αθηνών. Στρατούλη Γ., 2000. «Νεολιθικά εργαλεία από οστό και κέρατο. Συμβολή στην ανίχνευση δραστηριοτήτων των χρηστών του σπηλαίου Θεόπετρας Καλαμπάκας», in Κυπαρίσση-Αποστολίκα Ν. (ed. ), Σπήλαιο Θεόπετρας: Δώδεκα Χρόνια Ανασκαφών και Έρευνας 1987-1998, Proceedings of International Conference, Trikala, 6-7 November 1998, Athens, pp. 307-327. Tomkins P., 2009. «Domesticity by default. Ritual, Ritualization and cave-use in the Neolithic Aegean», Oxford Journal of Archaeology 28/2, pp. 125-153. Tsartsidou G., 2013. «Flora and People at the Palaeolithic cave of Theopetra, Thessaly, Greece», 114th International Meeting of the Archaeological Institute of America, Seattle 3-6 January 2013. Tsartsidou G., Karkanas P. and Kyparissi-Apostolika N., 2014. Palaeonvironmental reconstruction and flora exploitation at the Palaeolithic cave of Theopetra, central Greece: The evidence from phytolith analysis. Valladas H., Mercier N., Froget L., Joron J.L., Reyss J.L., Karkanas P., Panagopoulou E., Facorellis Y. and Kyparissi-Apostolika N., 2007. «TL Age-Estimates for the Middle Palaeolithic layers from Theopetra Cave (Greece)», Quaternary Geochronology 2, pp. 303-308. Φακορέλλης Γ. and Μανιάτης Γ., 2000. «Μαρτυρία 50.000 χρόνων ανθρώπινης παρουσίας στο σπήλαιο Θεόπετρας με 14C», in Κυπαρίσση-Αποστολίκα Ν. (ed. ), Σπήλαιο Θεόπετρας: Δώδεκα Χρόνια Ανασκαφών και Έρευνας 1987-1998, Proceedings of International Conference, Trikala, 6-7 November 1998, Athens, pp. 53-68. Χαμηλάκης Γ., 2000. «Ζωοαρχαιολογία της Νεολιθικής Θεόπετρας-προκαταρκτική μελέτη», in Κυπαρίσση-Αποστολίκα Ν. (ed), Σπήλαιο Θεόπετρας: Δώδεκα Χρόνια Ανασκαφών και Έρευνας 1987-1998, Proceedings of International Conference, Trikala, 6-7 November 1998, Athens, pp. 263-267. Χριστοπούλου Α., 2000. «Τα λειασμένα λίθινα εργαλεία του σπηλαίου Θεόπετρας», in Κυπαρίσση-Αποστολίκα Ν. (ed. ), Σπήλαιο Θεόπετρας: Δώδεκα Χρόνια Ανασκαφών και Έρευνας 1987-1998, Proceedings of International Conference, Trikala, 6-7 November 1998, Athens, pp. 293-305.